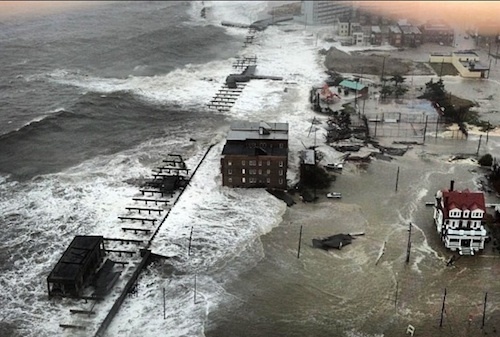 If current luck holds, North Carolina may well escape the 2013 hurricane season without the widespread damage that has so frequently plagued the fragile coastal region in recent years. Unfortunately, this brief respite is almost certainly only that – a temporary breather. Experts assure us that the impacts of climate change (including rising oceans and frequent, damaging storms) are sure to remake the coast in myriad ways over the decades to come and will, quite likely, permanently submerge large tracts of real estate. So, what does our best science predict? And what can and should we do – especially in a state in which policymakers have actually passed a law denying that sea level rise is even occurring? Come explore the answers to these and related questions with our special guest, Dr. Robert Young of Western Carolina University. Rob is a Professor of Geology, an accomplished author and a nationally recognized expert on the future of our developed shorelines. Recent natural disasters like the BP gulf oil spill and Hurricane Sandy have also made him a sought-after media figure and commentator who has appeared on CNN, NPR and several other media outlets. Don’t miss this important opportunity to hear from this genuine expert on this badly-misunderstood subject. When: Wednesday November 20 at 12 noon. – Box lunches will be available at 11:45 a.m.
Where: Center for Community Leadership Training Room at the Junior League of Raleigh Building, 711 Hillsborough St. at the corner of Hillsborough and St. Mary’s Streets). Click here for directions and information about convenient parking options. Admission includes a box lunch. Questions?? Contact Rob Schofield at 919-861-2065 or rob@ncpolicywatch.com. Our best science is done when we stick to the scientific method. There was a hypothesis, one that not only included global warming but also claimed that warming was caused by human activity. It claimed that for each measurable increase in CO2 in the atmosphere there would be a given amount of warming. Based on that relationship many models were produced that predicted future temperatures based on the expected quantity of CO2. What were the results? While we have met their prediction regarding CO2 increases we have not met their predictions regarding temperature. This was not the case for just one of the scientific predictions, but all of them. The hypotheses was tested and found wrong. Science demands a new one. And sunspot activity shows a much higher correlation to global temperature changes than CO2 ever has. We’ll be counting on you to come explain the scientific method to Professor Young. I would also note that ocean levels rise above their mean during storm events such as Sandy assuming prevailing winds are blowing shore-ward. 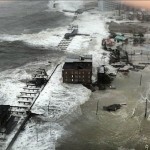 This temporary effect is commonly known as storm surge and has no relationship to predicted increases in ocean depth due to hypothetical global warming. We’ve got a lot of things to worry about in this country, but this one is definitely close to the bottom. I wouldn’t lose any sleep over it. ITT person who doesn’t understand the scientific method tries to explain the scientific method. – Formulate question — Does man-made CO2 warm the planet? – Hypothesis — Increases in CO2 begets predictable global warming. – Test the Hypothesis — Specific amounts of warming was predicted via multiple models due to CO2 . – Review the results — The warming fell far short of expectation. – Conclusion — While CO2 had an impact on heat retained in the atmosphere CO2 is not the driving force behind global temperature fluctuations. This is where real scientists either ask a different question or reformulate their hypothesis while the unscientific having only concluded that they would lose their government checks if they were to give up on CO2 chose instead to feign a belief in CO2 driven warming. There is another conclusion to be had… that the government funding of science distorts science. gregflynn — Are you suggesting an alternate theory to fluctuations in ocean level? That the draining of underground water is adding to the depth of our seas? It appears that you recognize that the CO2/warming hypothesis failed testing and that you are offering an alternative. Although I doubt your suggested dynamic is occurring, we all appreciate the application of the scientific method. Nitwit, we’ve all been through 6th grade science and just bc you may have passed as well we don’t need you explaining something that simple. Now if you had a phd in climate sciences it might be worth a second to read your ignorant nonsense of a post but I will continue to get my science information from the professionals thank you very much. Btw if your looking for a good doctor maybe try calling papa johns, they have the freshest ingredients. I’ll take the word of NASA over that of a space cadet. ML, your denial of 6th grade science is troubling. Be reminded that I went through the trouble of making an argument while you have simply fallen back on a desire to believe. Prove me wrong but avoid falling back on your desire to believe. …but for an 18 month period beginning in 2012, the oceans mysteriously dropped by about 7 millimeters(about 0.3 inches), more than offsetting the rise. That means that at the end of an 18 month period the oceans read 0.45″ (0.3″ plus the 0.15 expected over an 18 month period) lower than projected. Really? Nearly half an inch off of projection over 18 months? And supposedly this half an inch of water sourced from the surface of all the oceans of the world (or said another way, sourced from 3/4 of the surface of the planet) simply soaked into a relative postage stamp of soil in Australia? I suggest reassessing some assumptions, starting with the 0.1″/year of ocean rise. Since 2011, when the atmospheric patterns shifted out of their unusual combination, sea levels have been rising at a faster pace of about 10 millimeters (0.4 inches) per year. And supposedly this nearly half an inch of extra water that suddenly appeared to cover the surface of 3/4 of the world came from the crocodile tears of science deniers? Climate scientists are constantly reassessing their assumptions. But the main assumption—that molecules of CO2 act as sinks that end up radiating their heat even when sources of radiation are reduced or withdrawn, and that as concentrations of CO2 increase, this effect becomes more pronounced—well, that’s the chemists’ bailiwick. Someone might want to talk to them. Someone may want to check my math, but for 7 millimeters of water spread across the surface of the world’s oceans, I get 2520 cubic km. About 25% smaller than Lake Huron. Sounds more like an extreme weather event than Noah’s Flood, but when you regard a continent 3 million square miles in area as a “postage stamp,” making those sorts of distinctions of scale may be difficult. As would be projecting the cataclysmic effects of adding a Lake Huron to the world’s oceans every two years over the course of 50 years or so. Is Australia a postage stamp relative to the area of the world’s oceans? How deep would the missing 4151.5 cubic km of rain be if it all fell on Australia? (11.5 mm)(46.93) = 539.72 mm of rain had to have fallen on Australia. If all the water that was missing from the oceans fell on Australia the rains would have totaled 539.72mm (21.2487″) in depth over all of Australia.